I am a writer living and working in London busy doodling around the idea for my second novel and rewriting my first. New to blogging at the beginning of 2011 I undertook to make a daily post during that year, and have carried on. What started as an exercise to overcome my fear of the online world, and to understand how it worked, has turned into a regular part of my day, both reading other people’s and writing my own contributions. Now, I write about my interactions with the world, what I’ve seen, what I’ve read, where I’ve been and, sometimes, what exasperates or fascinates me. Oh, and I make stuff up. Day 2 and going really well. Love the picture that you have chosen . Margaret. Added to my Favourites as well. I love your writing! Jill, Thank you very much, and than you for subscribing. Just as I was losing a bit of confidence, you have given me real encouragement! 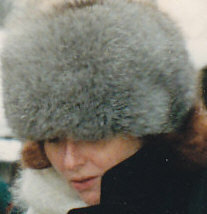 I spent a winter weekend in Moscow late 1980’s, so look forward to your memories of that city. I noted your connection with Cove Park some months ago…my family still live in Glen Eden, Cove, where my sister has a little ceramics studio. Evelyn…from the now destroyed Hermitage. BTW, I don’t see what you mean by “…the tacky ads at the end of the post…” I don’t see any ads, unless you’re referring to the buttons for Facebook, Twitter, etc. You can remove those if you want under “sharing” I believe. Thank you. For readers who are not logged into WordPress, they see advertisements on the blog, put there by WordPress. Hi Rowena, Cecile’s Writers has nominated you for the “Tell Me About Yourself Award”. That’s really lovely of you. Thank you! That’s very kind. Thank you very much. I very much enjoy your blog too. Thank you very much for the nomination. It may take me a little while to build up to it, but I really appreciate it.